The city enrolled more than 53,000 children in full-day pre-K for the 2014-15 school year. 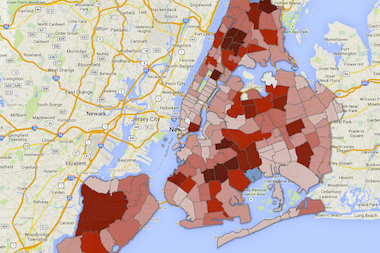 DNAinfo New York has the breakdown of how many newly enrolled kids there were in each zip code. LOWER MANHATTAN — The city added thousands of new full-day pre-K seats this fall, boosting enrollment in neighborhoods across the city. The South Bronx's High Bridge, the West Bronx's Tremont and the border of Bushwick and Bedford-Stuyvesant saw some of the biggest jumps in the number of 4-year-olds attending the free programs this year, according to data released by the city on Wednesday. Areas that had the fewest new full-day pre-K seats added included parts of TriBeCa, Battery Park City, SoHo, Greenwich Village and Roosevelt Island. A couple of neighborhoods, including part of East New York and part of Woodlawn saw slight dips in pre-K enrollment. Mayor Bill de Blasio, who made expanding full-day pre-K the cornerstone of his agenda, announced Wednesday that the city met its goal of enrolling more than 53,000 kids in programs. "We are happy to announce that we do have a final figure, and it’s a great figure for the number of kids who are getting full-day, high-quality pre-K in New York City today: 53,230 in seats as we speak," de Blasio said at the Financial District's Spruce Street school, which added a new pre-K class this year. "The enrollment numbers are part of the story, the programs themselves, the quality of the programs, the impact of the programs, obviously that’s what we’re here to achieve." Mary DeBey, a professor of education at Brooklyn College, said in an interview that she was "encouraged" by the numbers of new seats in parts of Brooklyn like Brownsville and Sunset Park. "The area which Brooklyn College Early Childhood Education works with are in neighborhoods where children are most vulnerable, and when I look at the map, the city pretty much added seats where we put our most highly-qualified teachers," DeBey said. Next year, the city plans to offer free, full-day, pre-K programs for every child in New York City, de Blasio said. That means creating 20,000 additional seats by next year. To meet that goal, the city will be creating new early childhood education centers and is asking the School Construction Authority to focus on neighborhoods where there is demand for more seats, de Blasio said. There were waitlists for pre-K seats in areas like Lower Manhattan, central Queens and "all the neighborhoods you would expect based on population patterns," while there were also some areas where there were more seats than students, like in part of Central Brooklyn, Deputy Mayor Richard Buery explained. "There are neighborhoods around the city where there was more demand than supply and so that's a part of what we are planning for next year," he said.